CRANBURY, NJ – The Academy of Oncology Nurse & Patient Navigators (AONN+) had a strong presence at the first of the Biden Cancer Initiative’s “Conversations with Dr. Biden,” held on March 10, 2018, in Austin, Texas. Hosted by Jill Biden, MEd, Co-Chair of the Biden Cancer Initiative, these conversations are being held across the country in intimate community settings to provide members of the patient support network — families, caregivers, patient navigators, and others — with the opportunity to share their perspectives on the cancer journey. Of the 10 people who participated in the event, 6 were AONN+ members, including Danelle Johnston, MSN, RN, ONN-CG, OCN, Chief Nursing Officer, Senior Director of Strategic Planning and Initiatives, The Lynx Group, who sits on the Biden Cancer Initiative’s Advisory Committee. The Biden Cancer Initiative builds on former Vice President Joe Biden’s work on the National Cancer Moonshot Initiative by developing and driving implementation of solutions to accelerate progress in cancer prevention, detection, diagnosis, research, and care, and to reduce disparities in cancer outcomes. To fulfill this mission, the initiative is working closely with patients and patient organizations, cancer researchers, cancer centers, research universities, governments, and the private and philanthropic sectors. For more about the Biden Cancer Initiative visit BidenCancer.org. Johnston was named to the Biden Cancer Initiative’s 25-member Advisory Committee in late 2017. She joins other healthcare providers and medical professionals aiming to transform the way cancer is detected, diagnosed, and treated. A key focus for the committee will be uncovering ways to standardize cancer care, data sharing, clinical trials, and patient navigation. 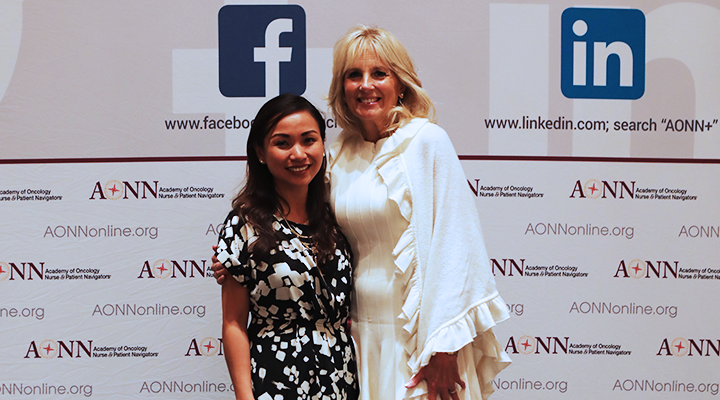 The Academy of Oncology Nurse & Patient Navigators, Inc. (AONN+) is the largest national specialty organization dedicated to improving patient care and quality of life by defining, enhancing, and promoting the role of oncology nurse and patient navigators. The organization, which has more than 7,000 members, was founded in 2009 to provide a network for all professionals involved and interested in patient navigation and survivorship care services in order to better manage the complexities of the cancer treatment process. The Journal of Oncology Navigation & Survivorship® (JONS; www.jons-online.com) is the official publication of AONN+. It is published 12 times a year and features topics related to patient navigation and survivorship care. The Journal of Oncology Navigation & Survivorship offers original research, best practices, interviews, case reports, and study highlights, as well as a platform through which navigators can share research and views on navigation and survivorship issues. CONQUER: the patient voice® magazine (www.conquer-magazine.com) is AONN+’s premier forum for patients with cancer. CONQUER features articles written by and for patients with cancer, survivors, nurse navigators, and other oncology team members. This magazine addresses the issues that patients, their family members, and caregivers face every day in an easy-to-read format. Issues include interviews with patients with cancer, information on access to care, and articles on lifestyle topics such as nutrition, stress management, personal finance, and legal and employer issues. It also features patient stories that are nominated for the AONN+ Hero of Hope Patient™ Award, which will be presented at the AONN+ Annual Conference. All stories are compiled in a special issue of CONQUER at the end of the year.